Don't ask, but know that next year I'll briefly be a member of the Over 50, Under 5 club. Yay! I'm not mentioning this to get any birthday greetings from you readers, I received plenty of those from all my closest friends - through Facebook, of course. Almost no one at my work even realized it was my 'special day', which shows where the Venn Diagram between my FB friends and Co-workers intersects I suppose. Anyway, the real reason I mentioned my birthday, is because although I received a whole lot of love, hugs, smiles, and cool stuff from my loved ones, there was one teensy little present which I just had to enjoy right away. No, I was IMPLORED to. Lukas actually got me a hilarious card that featured a Honey Badger having eaten my cake. We laughed a lot at that one together, because....how can you not laugh at a Honey Badger? 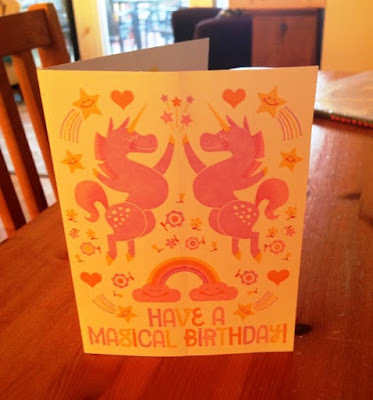 Then I opened the card from Annabelle, which was an awesome High Fiving Unicorn card! And if that wasn't cool enough, when I opened the card, out slid a Tattoo set. Annabelle shrieked with delight as she grabbed the pair of tats and proclaimed that we were both going to get one of them right away. Then she looked at me in all sincerity, and asked "Can we do it now Daddy? Right now?". How could I say no to that? Well, I couldn't. End of discussion. All I had to do was first choose which of the two I wanted, since it WAS my Birthday and all. Now, I must admit that this was a pretty difficult choice. 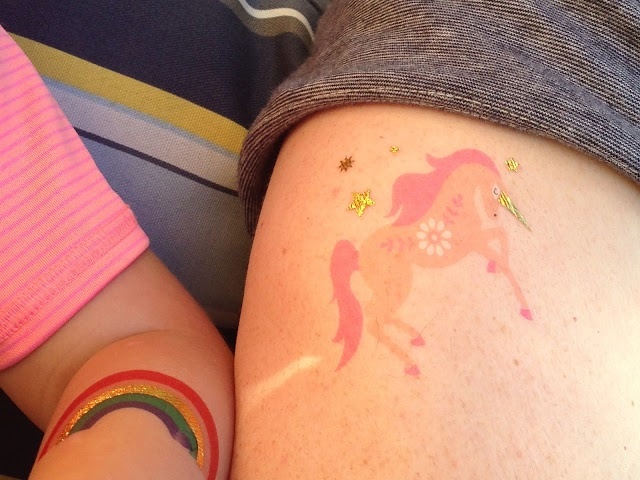 But in the end, Annabelle was perfectly happy that she got to adorn her arm with the remaining colorful Rainbow tattoo. As for me? More magic. Not the run of the mill kind either. But the pure, unfiltered kind. Yeah, the good stuff. I chose the Unicorn because of all those Magical powers. And, I'm pretty sure the world was at complete peace for a second or two after it's application. Plus I heard harp like music from nowhere in particular. Unfortunately for me once I had this pink beast tranfered onto my arm all the existing tone and muscle definition seemed to disappear from my bicep instantly. Must be a side effect. Thanks Sweetie! And, Happy Birthday to me. I'm not going to wash this arm for quite some time. At least until the Mariners make the playoffs. Glad it was a magical birthday. And no - don't take that as a birthday wish since you do not want them.